When you’re coping with infertility, the last thing you want to hear is someone telling you to relax. I’ve been there. I’ve heard it all. Well-meaning friends telling me that “it’ll happen when it happens” or “you’re trying too hard, just relax!” or any other number of things that made me want to shake them. Words hurt, even if you really don’t mean for them to hurt. I wish I had a guidebook to give my friends and family back then. Something to let them know what I was going through without having to explain it over and over. Something like Don’t Tell Her to Relax: 22 Ways to Support Your Infertile Loved Ones by Zahie El Kouri. Zahie has been in my shoes. She knows what it felt like to hear “I’m sure it will happen for you soon” and want to scream “really? You KNOW? How did you get this inside information to my body? When is soon?” Over-reaction to a super well-meaning comment? Maybe. But when you go through 60 soul-crushing cycles of negative pregnancy tests, rationality goes out the window. 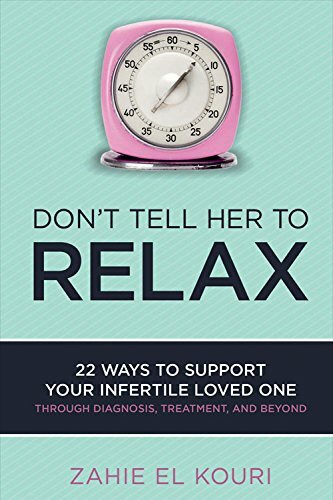 Don’t Tell Her To Relax is like a guidebook for the family and friends of couples struggling with infertility. It’s a far gentler guide than I would have written. In fact, I started a book years ago and realized that I was still a little raw from the experience, so I put it away (and forgot about it). Zahie explains all the ins and outs of infertility, including exactly what it means to be infertile. She details the different TTC terms that you’ll hear as you talk to your loved one and give you tips on more supportive alternatives to the things you may THINK are supportive. Example: rather than saying “You’ll have a baby soon,” say “I’m sending you fertile vibes!” Or, if you’re religious, you can say that you are praying for your friend. I am not religious, but I still appreciated it when those who were said that because it meant I was in their thoughts. Each chapter focuses on a different aspect of supporting your ILO (infertile loved one), from keeping her company during her trips to the doctor to supporting her throughout her pregnancy when it does happen. I really appreciate that Zahie reminds readers that the emotion struggle with infertility doesn’t stop just because the second line appears on the pregnancy test. I lived in fear that I would wake up and find that it was all a dream. In fact, I keep “proof of life” in every room of our house, even the bathroom. Basically, I keep some physical sign of my son’s existence everywhere. A stuffed animal, a toy, a picture: I need tangible objects to let me know that it’s not a dream. Yep. Even ten years later. THAT is how much psychological damage years of infertility can do to you. Everyone wears their infertility battle scars different, but believe me, we all have them. Through it all, Zahie talks to you like a friend. She treats you the way she knows you want to treat your ILO: with respect and kindness. She, like I did deep down, knows that you really DO want to be supportive and say the right things, it’s just hard when you don’t know what your loved one is really going through. If you have a loved on dealing with infertility, I highly recommend grabbing a copy of this book. If you are dealing with infertility yourself, gift a copy to everyone you know and they’ll take the hint from there (I hope!). It’s only $2.99 on Kindle and $3.95 in paperback on Amazon. Have you struggled with infertility? What is one thing you wish your loved ones understood better about it? I haven’t gone through this personally but it’s nice to know about this book in case someone I know goes through it. I’d want to be a supportive but certainly don’t want to say the wrong things! I love the title of the book for sure! Great book for a friend i know that could really benefit from this. I love. Love that it focuses on different aspects in each chapter. And the price is perfect! I really like this book about how to help those loved ones that are having infertitilty problems. I have heard the saying-Just relax all the time. I usually say that I am thinking of them and my prayers are with them. This is a good one to say. Give a big hug and be supportive is always good! I struggled with infertility about 30+ years ago before getting pregnant with my 2nd daughter. This would have been a great book to have read back then. I am sorry to hear about your struggles, but I’m so glad to hear that you got your happy ending with your daughter.